You are confusing several aspects of certificates and CAs in your blog post. First, you purchased a wildcard cert, which is fine for lab use (although generally frowned upon see http://www.eweek.com/c/a/Security/The-Risks-In-Wildcard-Certificates/ ). This is not a subordinate CA, it is a certificate that allows external third parties to trust your SSL/TLS site by verifying the certificate against a public trusted CA. Eric’s article describes how to build an internal CA using Win Server 2012. He sets up both a root and subordinate CA. The subordinate CA is used to issue certificates to end users or servers. Due to it being only trusted by machines on Eric’s network, it’s not suitable for public use generally. More critically from a security point of view (and good on Eric for pointing this out) the private keys used to setup the CAs are not secured by an offline root or HSM. This leaves the systems vulnerable to attack and the whole CA to compromise. Not confused at all. I think you missed the point that my Windows Active Directory domain is daisettalabs.net. And the domain I purchased is also named daisettalabs.net. That’s why I built a subordinate CA, not a root. I’m using each piece of infrastructure in its appropriate role/place. May have not been clear on that. No, I didn’t miss your point. They both may have the same name from a DNS point of view, but you cannot build a subordinate CA from an externally purchased certificate such as your wildcard cert. 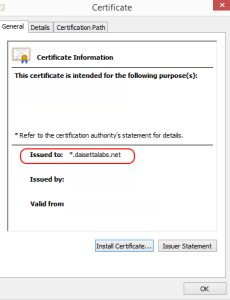 The process of building a sub CA in the Windows server 2012 wizard requires a root certificate in AD or the local cert store in Trusted Certificate Authorities. Once you set the sub up, you then have to get it’s CSR signed by the root in order to enable the sub to work, otherwise the certificate services won’t start (and you can’t issue certificates to your domain). My basic point is a wildcard certificate is not a subordinate CA. It’s an end user/device certificate. Yes, you’re correct. I built a root CA for the Active Directory domain, not a subordinate. Thankfully it wouldn’t let me as you pointed out. Just checked.I’ll correct the post and cite you. I grant that and wish I had been more clear. I did this back in March/April and I remember being a bit confused; I had dlab.net as an AD domain in the lab, but I had a longer-term goal of establishing various CNames.daisettalabs.net on the web, or into Azure etc. So I bought a wildcard ssl for that purpose.